Already a paid subscriber? Log in here to access the Club. * Get MY EXPERT advice on YOUR knitting questions. SweaterBabe is your knitting coach! EVERY MONTH, Knitting Club Members will receive at least one NEW, never released knitting pattern to download! Knitting Club Members are the FIRST to get them -- always before they are offered to non-members for purchase on SweaterBabe.com. You'll ALWAYS have something new and exciting to knit! I'm like your own personal knitting coach! Ask SweaterBabe YOUR knitting questions in a Members-only forum. ONLY Knitting Club Members' questions will be answered by SweaterBabe -- you get first priority. Hone your knitting skills. Learn new techniques right the first time. Tap into my vast experience to figure out a poorly written pattern. Get advice on which yarn choice will make that next project turn out great! Knitting Club Members get automatic entry in special product giveaways. Win cool knitting tools, additional free patterns, specialty yarns, or other neat stuff just by being a member. 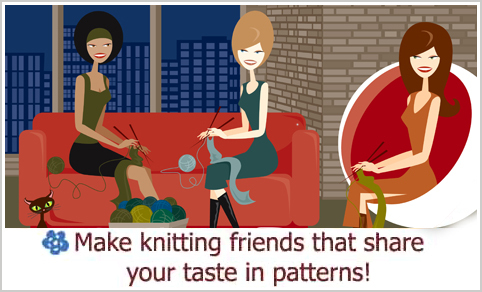 Meet hip, like-minded knitters from all over the world! Have fun in our members-only forum sharing ideas, style tips, swapping advice, or just gossiping! Just by joining, you instantly become part of a super exclusive, Members-only network of knitters (including me, SweaterBabe) who all share a discerning taste for hip, chic, and modern knitting designs! Join or start KALs, get opinions on yarn and color choices, share your latest and greatest projects or your WIPs. You'll get more than your money's worth of great patterns, advice, and friendships every month. But, if you don't like the first month's benefits, simply email me and I'll give you a full refund. In future months, you can cancel anytime and I'll cancel all future subscription payments. since it's all backed by a money-back guarantee. The knitting club has been going strong for over 7 years! Come be a part of it. I look forward to meeting you at the Club!